Why set traditional K'NEX challenges? All K'NEX sets, in common with other construction kits, provide detailed pictorial instructions showing how specific models may be built. These are fine for getting started, and building models step-by-step from instructions does initially provide some enjoyment and satisfaction to K'NEX users. Such an approach in our view, though, only scratches the surface of the potential of the K'NEX construction kit. In 1996 the founder of the K'NEX User Group, Andy Shercliff, introduced the much more exciting concept of "K'NEX challenges", in which a K'NEX model must be built to meet a stated objective, without any instructions being provided. An example would be "build a K'NEX mousetrap that can catch a mouse without hurting it". This is a more challenging approach than simply following instructions, but properly done it is more educational, and gives a greater sense of achievement. All the "Traditional" K'NEX challenges in this website are based on this approach. We define the Objective of the challenge, and then give some Handy Hints that may help the children as they proceed to complete a finished product to their own design. We find the Design stage is usually done in the children's heads, plus discussion if children are working in pairs. Some teachers prefer a more formal design stage using paper and pencil, and this can certainly encourage children to think through their design before they start. Prototyping is critical - no-one should expect to produce a perfect finished model first time, and sometimes it is even necessary to 'go back to the drawing board' if a design idea simply does not work well enough. These five phases are described lower down this page. Please note that 60-90 minutes is usually sufficient to complete a Challenge, but some may take longer than others, particularly if all the suggested 'Conclusion' activities are used. Note we refer mainly to "children" completing challenges, in school. 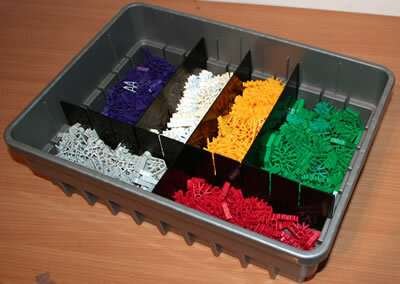 However, K'NEX challenges are also widely used in many other Educational settings, such as at home, in family learning and in adult education. Each of the 20 challenge sheets in this website has the sections shown below. View the Mousetrap challenge to see an example of a Challenge sheet. Title: The best title is one that is short and meaningful, and maybe also amusing (depending on your sense of humour!). Aim: A short description of the aim of the challenge, using language which should be appropriate to the age of the participants attempting the challenge. Levels of difficulty: K'NEX challenges are nearly always completed by groups of children and/or adults of mixed ability, and often also of mixed ages. The purpose of the three levels of difficulty is to ensure that all challenge participants can enjoy success by completing the first level of difficulty, whereas more able participants can also be stretched by attempting level 2 and level 3. 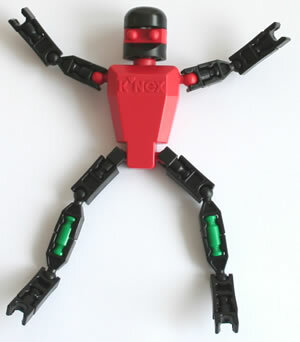 Equipment: List of K'NEX and any other equipment required. Safety: Any particularly important safety issues that must be considered in delivering this challenge. 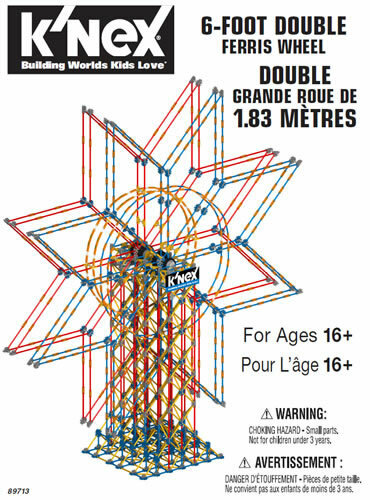 Note that we would strongly recommend that you carry out your own risk analysis before attempting any K'NEX challenges. Test Area: Any area that is required to test the challenge at level of difficulty 1, 2 or 3. Approach: Some ideas on how to approach the challenge, at each level of difficulty. The following sections are for the staff delivering the challenge, and are not usually shown to participants. Educational objective: The objective in setting the challenge from an educational point of view. Conclusion: Follow-on activities that can be provided to participants after the challenge is completed, either immediately at the conclusion of the challenge, or in the following days or weeks. Note for educationalists: We suggest that, once you have chosen the challenge(s) that best meet your needs, you "fine-tune" the challenges. (eg to make the wording more appropriate for the age and background of your participants). 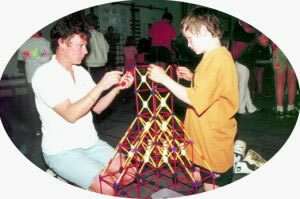 Challenges are typically selected from this website; from our 101 K'NEX Challenges guide; or by inventing them yourself. Your introduction to the challenge will depend upon factors such as the Educational setting in which you are working, the age of the children, their existing knowledge of the Key topics, and the teacher's own style. 1. We suggest you carry out any "Before starting" activities before you allow the children to open their boxes of K'NEX. 3. Explain that K'NEX is easy to use, and demonstrate the three ways of connecting K'NEX rods to K'NEX connectors (see Handy Hint A2). Note that we do not ourselves usually give copies of the Challenge Sheets to the children, but rather we use the Sheet as a 'crib sheet' for the teacher. Some teachers may prefer though to print the top half of the Challenge Sheet for their children. The next phase is to allow the children to design and build a model that will meet the objectives of the challenge. The amount and type of help given to the children during this Designing and Building phase is at the discretion of the teacher. In general, we find it is best to choose a balance between giving too little help (and causing frustration) and giving too much help (and losing some of the educational benefit). We find most help is needed in getting the children started with using K'NEX (particularly if it is new to them), and in planning the design of their model. Thereafter, constantly circulating around the tables to give assistance when requested works well. The Handy Hints listed on the Challenge Sheet may help. As the pairs of children progress, they will eventually reach a point where they believe they have completed Level 1 of the Challenge. If you are happy that they have done so, Level 2 of the Challenge can be explained to them, and if they complete that, Level 3. One concern that children often have is whether they are allowed to copy good ideas which other children in the class have built into their models. We tend to encourage this - it is in any case very difficult to prevent - provided that the pair have first attempted to solve the design issue for themselves. An example is level 3 on Windmills - making a hammer go up and down as the sail turns. This involves both a lever and a cam, and the children learn nearly as much by copying a successful solution as they would have by coming up with the idea themselves. The purpose of the Conclusion phase is to use the models the children have built to carry out further tasks, thereby extending the educational value of the session. There usually comes a point after (say) 80% of the session when the state of progress around the classroom means that the Building phase can be brought to a close, and the Conclusion phase can commence. The teacher is then able to call a halt to building, review with the class what has been achieved, and start the Conclusion activities. The ones shown on the Challenge Sheets are only guidelines - the teacher may well have other ideas for conclusion activities that fit in better with the children's current level of knowledge, the themes being followed, and the specific educational objectives. For example, the Crane challenge requires Designing Skills and Making Skills, and develops the child's knowledge and understanding of Structures. The principles of Balanced and Unbalanced forces underpin this Challenge, in that unbalanced forces cause unsuccessful models to fall over when they pick up a weight, whereas in successful ones the forces are balanced. It is therefore important not to let the Designing and Building phase go on too long, if the opportunity to gain maximum educational benefit from the Challenge is not to be lost. Once the Conclusion activities are complete, we would recommend that the children are asked to dismantle their models, and put all the pieces back in the box. This will probably take about five minutes, unless the models are very complex. Don't be afraid that the children will damage the K'NEX components in taking their models to pieces too vigorously. This is a rare occurrence. The benefit from the K'NEX Challenge will not necessarily end with the Conclusion phase. Many Challenge Sheets suggest one or more follow-on activities, which can be used in class in the days and weeks following the K'NEX Challenge. An example from the Windmill challenge is discussing where windmills are best sited, and finding examples of gears, pulleys, levers, and cams in bikes and cars. KNEX User Group | Free K'NEX resources | 125 K'NEX Challenges | Why set challenges?